The line in question is known as the West End Back Dock though another, possibly more offical, name is South Dock Siding. I have never seen a locomotive in there within the last 30 years. For many years the dock was home to a derelict van, with Buddleia growing over it and apparently out of it. Following the UK rail franchise re-lettings of 2006-2007, I wanted to see what a list of UK franchise operators and their corporate relationships would look like now. The map of their connections was created in a relaxed evening's work with Freemind. How to use the Freemind mindmap viewer : click in mindmap window below to activate applet. Make your browser fullscreen to see as much as possible. Scroll around the map with cursor keys or click-and-drag on the white background. Press ESC to centre map again. Right-click on objects in map for context menus. Click anywhere outside mindmap window to return to normal browser keyboard control. In 2006-07 most of the first round of franchises came to the end of their terms and were put up for re-letting. In an unanticipated round of blood letting in search of “best value for the Department for Transport”, few of them were retained by the incumbents. The early refranchising round was ushered in by the news that First Great Western (not a 1996 franchisee having bought out the original management team, but a TOC which did retain its franchise in the re-bidding) had gone back after a few weeks to renegotiate their terms and their DfT-approved rolling stock list, amidst widespread public protests from their passengers concerning short trains and withdrawn services. The DfT protested that fGW were free to restore services to any level they wished - but forgot to mention that fGW were under a tight agreement as to their bid for costs to run the services, or that their rolling stock had been allocated by the DfT to other forthcoming refranchises. The reason for DfT approving changes despite their own protestations of innocence in the cuts was that to restore the services altered, combined or withdrawn would cost more than the bid the DfT themselves had selected as "best value" for the tightly specified franchise. One original 1996 franchisee to keep their franchise was Stagecoach with the TOC once known as South West Drains, thanks to a complete turn-around in their performance measures and passenger satisfaction from bottom to top. What probably also helped Stagecoach keep their franchise was getting the long-delayed "Juniper" units (an embarrassing bit of post-privatisation rolling stock ordering) into service on the Reading line, thus saving the DfT from even more embarrassing "trains that never turned a wheel in service" stories at a time when public focus turned to overcrowding and the need to restore post-privatisation cuts in train lengths. Before a year was out came the collapse of GNER who had bid to retain their franchise on terms widely seen as ambitious, and were simultaneously hit by their parent withdrawing financial guarantees at the same time as business shrank following the July 2006 London bombings. They had no financial margin due to the tightness of their bid. After GNER, no further franchises went to the incumbent - I presume the DfT paniced and tried in this way to stop the increasing progression of optimistic bids from existing franchise holders. Most recently, Virgin, another early first-generation franchisee, have lost their Cross Country franchise to Arriva. Virgin retained their West Coast franchise, whose length was previously extended to 2012 on favourable management terms in compensation for their losses under the Railtrack-inspired planning and management disaster known as West Coast Passenger Upgrade. PUG, like the APT project twenty-five years ago, was an object lesson in railway engineering evolution rather than airline inspired revolution — but one which cost many times more than the entire APT project, which delivered less than APT would have, and which inconvenienced passengers throughout years of topsy-turvey engineering closures and disruptions. Still the Pendolinos look nice, even though at 125 mph (200 km/h) they are scheduled slower than APT's 1981 speed of no less than 140 mph (225 km/h). Also in 2007 Network Rail's first financial "Control Period" aka CP2 came to an end, and with it the generous funding they had been given to recover from the Railtrack mess. CP1 covered the disastrous tenure of John Major's and John Prescott's Railtrack, during which the reliability and safety of rail trackwork and signalling degenerated to appalling levels whilst the Directors sold off railway property they had inherited from BR in order to fund badly managed mega-projects and pay shareholder dividends. For Network Rail 2007-2012 (CP3), a new set of funding rules are being tried. The DfT were asked by the independent Rail Regulator to come up with two documents: a Statement of Funds Available (the SoFA) and the High Level Output Statement (HLOS), a specification of what they wanted the railway to achieve. The hope is - and I write as these documents have just been published - that requiring the DfT to focus their minds in this manner will lead to a more stably funded railway, a more sustainable railway in the medium to long term, and one less subject to change of direction from Whitehall each time a new crisis or new flavour-of-the-month arises. The same goals as we originally hoped for from privatisation itself, in fact ! And so the money-go-round continues. Did you realise that the overcrowded privatised railway today is costing more than three times as much total from your and my pocket than BR did, at a corresponding time in the economic cycle and similar passenger levels ? There was an "old BR" black joke that running a railway would be easy if it weren't for the passengers. If you thought party politicians meddled too much with British Rail, you've not kept track of the machinations of the transport Civil Servants "playing trains" during ten years of privatised railway ! Writing this in September 2007 the situation is not yet clear, but let us hope that the Mandarins of Transport have learnt their own corresponding lesson after once again getting their fingers - and our pockets - financially burnt. I read that 15F 3007 arrived in the UK at Immingham on the east coast this week, and was moved northwards to Glasgow by road low-loader from my local firm Heanor Haulage over the last 2 days (Weds/Thurs). The loco is initially on display in George Square in the city of its birth, Glasgow, to launch a £5 million appeal for funds for the Riverside Transport Museum. 3007 is to be restored and displayed there. The balance of the Museum's cost will be met by the National Lottery's Heritage Fund and by Glasgow City Council (Heritage Fund grants are usually conditional on matching some income from other sources). There is a nice little photo-report attached to the BBC's news item here and also a video report if you can get it to work (I couldn't). The rain hissed. Someone breathed an oath. Was Adlestrop - only the name. Than the low rainclouds in the sky. Many thanks to various people on Usenet in uk.railway and uk.media.radio.archers for all the links and pointers and most especially to Sid and Rosie for permission to quote their poems. Any further gallery pointers will be most soggily received. Thank you. "For those who wish to combine railway voyeruism with flood voyeurism there are some suitable pics at numbers 6-8 in this set. They give some idea of why fGW stopped running trains." First Great Wettern HST at Cheltenham, notice the waterfall from the platform onto the tracks. Appropriately named, a Voyager crosses the River Severn near Cheltenham. One of a number of serious washouts and landslips on the preserved Severn Valley Railway. An appeal has been launched for funds to repair the line, which is cut in several places. Banbury station is suggested for re-branding as the Banbury Canal, also here and also here. Adlestrop (which is on the Cotswold line) itself in drier days. Not forgetting the amazing BBC4 Monsoon Railway programme on India where they handle flash floods from a metre of rainfall. Six miles from nearest town. The Advanced Passenger Train is frequently quoted as one of the Great British Non-Starters of our time. But was it ? This isn't the original text: we didn't have HTML in 1993. I've also corrected a few points and added extra details! >it still there? It was in a bit of a state. That's a different train: the APT-E. "E" stands for "Experimental", and the APT-E was the technology proving train. It never ever ran in passenger service and was a completely different beast from the production train. 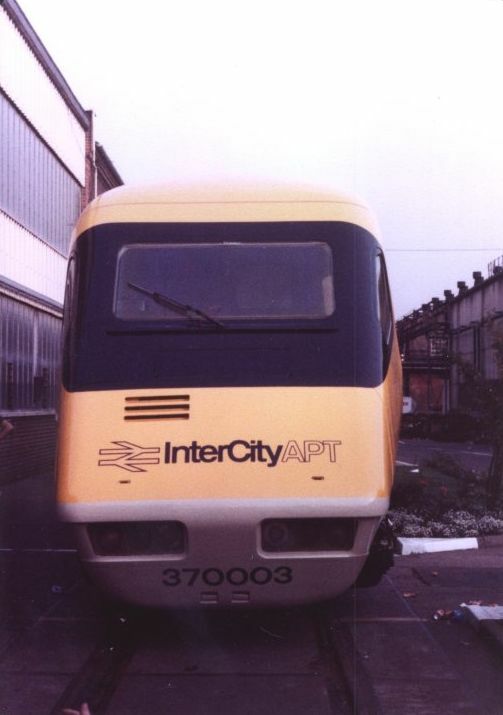 APT-E was only four cars long: two gas turbine power cars, and two trailers chock full of instrumentation. 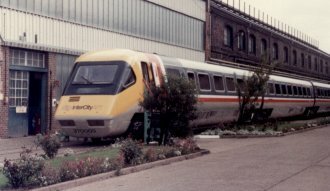 It ran regular tests in several places, but particularly on the Midland Main Line and the Old Dalby Test Track. It achieved its maximum of 152.3 mph on the Great Western. You're probably familiar with the photograph of a prototype Concorde making a low pass over the GW main line near Filton as the APT-E passed underneath. What a fluke that must have been for the photographer — I just cannot imagine it being set up! 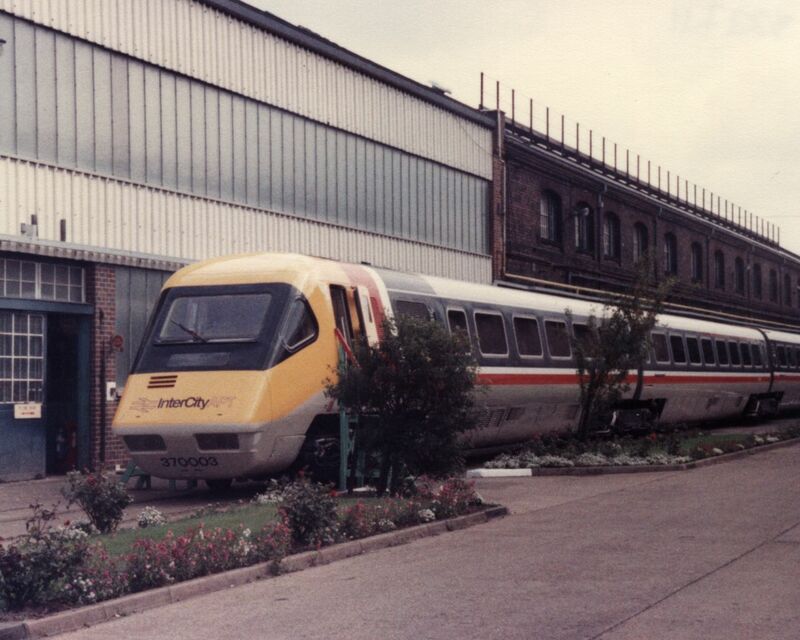 And, too, there are photo's of the APT-E and the experimental HST (41 001 + 41 002, later numbered as a multiple unit 252 001) side by side at Swindon. The train which did run in service was the APT-P, for "Prototype". There were three full trains, each composed of two identical half trains of driving trailer, six (I think) articulated cars and a non-driving electric Bo-Bo power car. The two power cars were formed in the middle of the train because, at the time they were designed, pantograph technology wasn't up to having two pans at opposite ends of the train both working at the 150mph envisaged for the train. 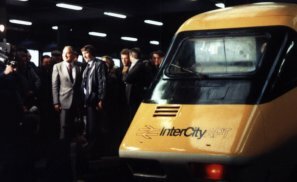 By the time they reached passenger service one half of each train had been reduced to just driving trailer plus power car because it wasn't economical to provide two full sets of staff — there was no access between the two halves except via a cramped, noisy walkway through the guts of the power cars. Launch was originally set and publically announced for May 1980, but technical problems meant several delays to the date. After it was again delayed from May 1981, to September and then October , the date was eventually set by fiat, and testing and tuning continued right up until Monday 7th December 1981, when APT-P was introduced to a blaze of publicity. However the major problem was that the night of 7th-8th December brought some of the worst winter weather for several years to the whole of England. 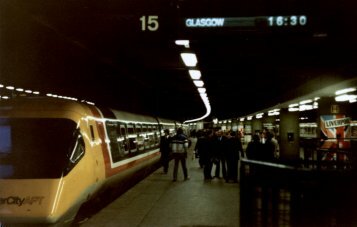 During the following three days British Rail tried to continue the APT service, but — as with most other stock on the network — moisture kept freezing, not in the high-speed hydraulic brakes, but in the air brake lines which were supposed to take over at lower speeds. On the Wednesday the southbound trip was cancelled at Crewe, amongst service problems all around, and the train withdrawn from passenger service. As far as the media were concerned that was the end of the APT. However the engineers kept working on tuning the tilt mechanism, or rather carefully de-tuning it to give the most sensitive passengers a sense of balance. And in summer 1982 the APT was very quietly reintroduced to service. 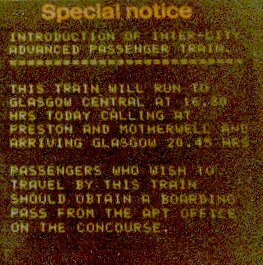 At first it ran as a relief train shadowing a normal service; later, as confidence grew, it gained its own departure slot, about 10.30 from Glasgow and an early evening return from Euston if I remember. I travelled on it several times between 1982–1984 and the ride was quite superb and the reliability exemplary. I deeply regret though that, photographically speaking, it was a bit of a 'jinx train' for me. I have many feet of badly-exposed film of it due to undetected camera failures or wrong exposure settings. But, though the train was technically a success, the political battle had been lost and the management will to build the APT-S ("Squadron") had evaporated. Eventually it was withdrawn from service; two trains were scrapped and one sent to Crewe Heritage Centre (now The Railway Age) where from time to time the newspapers rediscover "BR's Wonder Train Shunted Into History". Daily Telegraph: "BR's Wonder Train Shunted Into History"